Evolved Publishing has enjoyed an exciting few years since our first major book launch of March 2012. Just 4 short years later, we’re about to add our 40th author and publish our 160th book, over 140 of which remain active in our catalog. We have a great team of editors, artists/illustrators, and translators supporting those authors, too. And 2016 promises to be an exciting year during which we bring on board several new authors. As a publisher, we seek always to expand our loyal fan base of readers who demand nothing less than the sort of professional product we put out. We’re thrilled to be averaging over 4.5 stars in the ratings of our books–this after thousands of reviews. We’re also pleased to have been honored with a good many awards for our work, which you see at our AWARDS WON page. And so, as we prepare for an exciting 2016, we want to reward our loyal followers with a gift opportunity, and to welcome new followers with the same chance to experience our great books firsthand… and free. 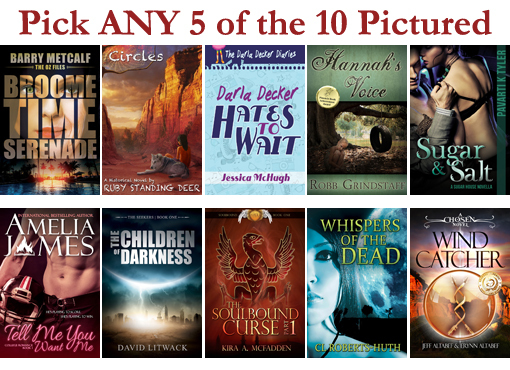 We picture 10 books above, and the lucky winner will be able to choose any 5 of those. Additionally, we’ll toss in a $10 Amazon Gift Card for the winner to use however they would like. Thank you, and enjoy! This entry was posted	on Saturday, January 9th, 2016 at 6:03 am	and is filed under Promotion. You can follow any responses to this entry through the RSS 2.0 feed. You can leave a response, or trackback from your own site.